Yesterday I mused on love. Today I turn to conflict. That is after all what makes a story. Genesis informs us that the descendants of Terah, father of Abraham, became six nations: the Israelites, Moabites, Ammonites, Ishmaelites, Edomites, and Midianites—and they have never gotten along well from ancient times to to present. The plot of Balaam’s Curse springs from a struggle between three of them as recorded in the book of Numbers. 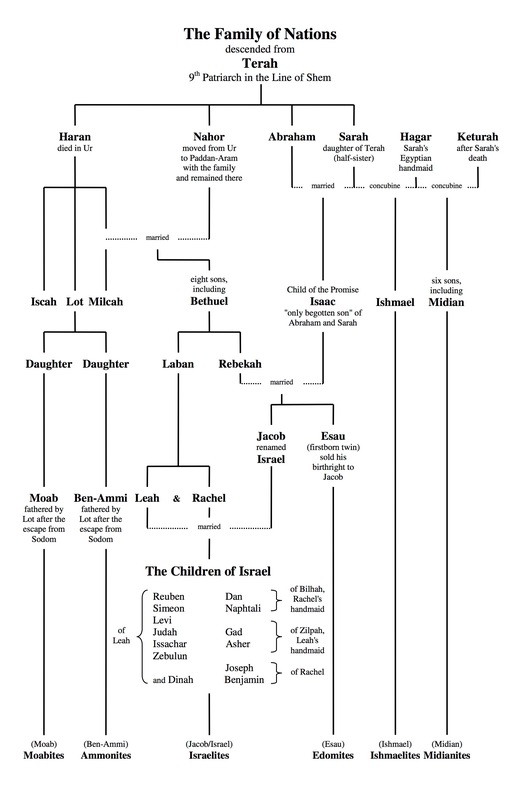 I’m sharing a chart from the back of my book because understanding the family connections between these nations as they rampage in and out of Old Testament stories is important to our understanding of the ancient text. Think of this chart not so much as genealogy or history, but as backstory to adventure! 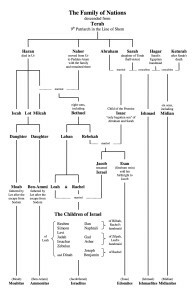 All six groups found at the bottom of this chart are “semitic” nations, because Terah was the great, great, great, great, great, great grandson of Noah’s son Shem. You may remember the story of Ishmael and Isaac—half-brothers with good reasons for jealousy and distrust—but did you realize that the Ishmaelites were the ones who bought Joseph (of the coat of many colors) from his older brothers and sold him as a slave in Egypt? Watch for other “rellies” to show up throughout the Old Testament. The prophets often rail against the treachery of the five non-Israelite semitic nations because they were cousins, something like the British, Americans, Canadians, and Australians. They should have been kinder to their kin. The prophets also rail against the Children of Israel because they were chosen to bless all nations. Much of the time they were nearly as greedy and cruel as the rest of the world. Like us, they were human! These six nations shaped the Middle East as we know it today. The tribes of Judah and Benjamin along with remnants of Levite priests and scribes became the Jews (named for the leading tribe, the tribe of Judah) after the remainder of the “Children of Israel” were scattered and lost their identity. The ten lost tribes most likely became part of the mingling and mixing of the other five semitic nations that shape the Arabic world as we know it today. Talk about conflict. Obviously, the family squabbles were not settled in Bible times. This week, in the afterglow of the love you celebrated on Valentine’s Day, pray for love and peace in the Middle East. Pray that they all—even members of ISIS—discover that only Love wins in the end. Pray for love and peace for all humanity. We are in the end all one family.